I've been reflecting a lot lately on how, for many, home ownership is the foundation to anchor, and nurture, our physical, emotional, mental and spiritual needs. For the vast number of Canadians, home ownership is symbolic of being 'biologically on schedule'; about two-thirds of Canadian families own their own home, which ranks near the top percentile in the world. What is at the centre of that undeniable lure towards home ownership? Consider this: Renowned American psychologist Abraham Maslow in his 1943 paper, “A Theory of Human Motivation” established a hierarchy of human needs. The theory is that these needs follow each other in succession and priority. The pyramid’s base is upon basic, physiological needs, with the need to procure food and shelter on the bottom. Moving up the pyramid, the next level is safety and security, followed by love and belonging and self-esteem, topped with the pinnacle of self-actualization. The theory is that once a person satisfies the initial needs, they move up the pyramid to the next, in a bid for self-actualization. This model has a number of uses, but has been widely applied in sales and marketing, because it helps to identify human motivation towards purchase. In Part One of this two-part series, I explored how Maslow’s theory can be utilized by property sellers, because it helps them position their product (their home) in a way that will motivate Buyers to buy.... and to pay top dollar! In this Part Two, I'm exploring how Buyers, according to Maslow's theory, meet their needs, wants, and desires in their pursuit of home ownership while proposing that the ongoing cultural commodication of housing and home in Toronto - and its resulting increase in property values - reflects a collective consumer spending movement towards perceived self actualization. So let's explore the theory as it applies to real estate. Obviously, housing physically provides shelter, but it also satisfies the basic psychological need for shelter. At the outset, this is what may spur a Buyer into action initially. When you look at a Buyer’s housing wish list, it’s unlikely to read “roof over my head” as item one, but that is the context at the outset of that housing hunt. To take this one step further up Maslow’s pyramid, shelter equates to safety and security. From a Buyer’s perspective, real estate satisfies the need for safety and security not just in the literal sense of the word, but also as an investment. I've also broken down how the value of a property can be calculated, which can help Buyers to participate in satisfying that need for financial and psychological security. Click here to read our post on 'The Value In Buildings.' and in this piece called 'What Is A Home Worth Today?' which outline three common approaches to establishing value - the Cost, Income and Market Value approaches of real estate. To really satisfy that need for safety, a Buyer has to consider how their potential home will address that factor. As a homeowner, you’ll be required to do ongoing maintenance and repair to maintain the housing envelope that is the shelter. Whether consciously or unconsciously, that is a factor a Buyer will weigh in selecting their home. That is in part the reason why my team and I run an ongoing series at urbaneer about Healthy Homes, where we provide homeowners with resources on how to protect themselves against hazards like Radon Gases, and how to recognize poor construction materials, like Kitec Plumbing and Knob And Tube Wiring. These are just a few of our posts worth reading. After basic shelter needs are met, Maslow says that humans move on to the need for love and belonging. 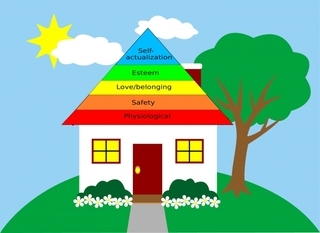 When you consider the emotional connection many of us feel our 'Home” provides, you can clearly see how Maslow’s pyramid subscribes to that Buyer need, and figures into the house hunt. Just ask any prospective Buyer about that experience of discovering 'Home'. They can’t necessarily describe the physicality of it, but they can certainly determine when they are presented with it, and can identify the emotions associated with it. The need for love and belonging is what 'Home' is all about. It’s where you place your roots and where you are able to provide shelter, comfort as well as create a mutual environment for that love to those you hold most dear. That’s a big reason why Buyers need that emotional connection to move from interest to purchase. Click here to read 'Dear Urbaneer: How Can I Create An Emotional Connection Through My Home?' or Chapters Of Life: The Value Of ‘Home’ for my past pieces on how, in my opinion, houses are like people: individual, special and radiating emotional connection. Housing not only gives you a place to lay down your roots and to express yourself, it unequivocally promotes a sense of belonging, as we address in 'Why Do We Love Where We Live?' Your home is part of a greater community, whether it be a fabric woven of multi-cultural influence, a tight-knit community of like-minded people, small town living or urban living that promotes pedestrian living. You get to choose how you fit in and how your housing physically represents your place in that community - visually and socially. So, after a Buyer has satisfied security and safety, along with establishing a space for love and belonging, they move along the pyramid to self-esteem. No question, housing represents status for many. It is a common goal for countless people and a mark of accomplishment as you move along life’s milestone ladder. It’s important to note that status is a largely relative term, simply because it means different things to different people. People also use their homes to reflect their social and financial status, by tapping into some of the social status associated with housing types. Our language even purports this status. Think about it, if you tell people you live in a shack, a mansion, a penthouse, or a loft, it immediately conveys something about you. The same goes for what we wear, what we drive and even our occupations. And however it is that you perceive status, it feeds into your sense of self-esteem, working your way up Maslow’s pyramid. How do you know when you’ve reached the point of self-actualization? If you’ve climbed your way up the rest of the levels of the pyramid, but you’ve saddled yourself with debt to reach those levels, are you truly self-actualized? Furthermore, is someone in a modest home with no debt, but values the independence that provides, are they more self-actualized? It really depends on your personal goals and a number of other variables, like values, cultural influence, geography, upbringing and personality - among others. All in all, it’s a deeply personal journey. On the same note, there's a difference between buying a house to be a commodity and buying a house that will be a Home. If you approach real estate strictly as bricks and mortar and free from the emotional realm, it invites a lack of rootedness and connection. If you're already crunching the numbers trying to calculate your future profit, in some ways you already have one foot out the door, which means it can never be truly grounded as a Home. Ultimately, you have the choice. For those who elect 'Home' you know when it’s 'the one'. Much like a romantic partner, the property speaks on a deeper level. You see it and know that the property has the capacity to be a forever home and see you into old age. You make the commitment to pay whatever the price of admission because it's calling you. You know the space will feed your soul which is a rare gift to find. In fact, it's priceless. And if you're fortunate enough to secure it, you'll discover you're more grounded it in. When that magic and spirit of 'Home' is in your life, I believe you have the opportunity for self actualization. If your intuition knows it's ok to spend every cent, then that home will nurture you in return. A home well-loved frames you. It holds you up. This frame isn't judged by how big or shiny it is. It's how it suits you. It's how you wear it, and it wears you. So regardless of your status, if you can change it to suit your personality with whatever limited resources you may have, that spirit of Home will shine and you will feel you have everything you need, which really is what achieving self-actualization and climbing up Maslow’s need based pyramid is all about. Want to read Part One? Here's Maslow’s Hierarchy Of Needs And Toronto Real Estate For Sellers! Whether you are buying or selling, it makes good sense to take a step back and determine some of the reasons that you have the reactions, experience the emotions and journey in the way that you do. There is far more to real estate than the transaction- both for us, because we invest in you for the long haul and for you as a buyer and seller. With decades of experience that let us understand the market on all levels possible, my team and I are here to help!